Screencasts--video tutorials that focus on a captured computer screen accompanied by narration--are an increasingly popular instructional medium. They show rather than simply tell, making them a solid aid for illustrating what can be confusing concepts when confined to print. Producing a polished screencast, however, requires more than firing up any old screen-capture utility, pressing Record, and nattering away into your MacBook's microphone. You want a tool that captures action at acceptable-and-better frame rates, offers flexible export options, doesn't slow you down by taking dozens of minutes to render your work, has enough flexibility to capture not only your Mac's screen but also an attached camera, and provides an easy way to focus on the portion of the screen you'd like to draw attention to. If that tool also includes a good set of editing and annotation tools, you've really got something. And "something," in this best sense of the word, pretty well describes Telestream's $99 ScreenFlow 4. We've covered the basics of previous versions of the application in our ScreenFlow 2 and ScreenFlow 3 reviews, so I needn't run through all the features introduced in the past. Rather, I'll sum up the workflow. Click the Record button, and you see a countdown, which allows you time to clear your throat and organize your thoughts for the upcoming recording. ScreenFlow then captures the Mac's entire screen. When you're finished, stop the recording with a hotkey or menu command. The ScreenFlow editor pops up immediately (no rendering needed at this stage), complete with your recording. At this point you put ScreenFlow's editing tools to use in a timeline interface and, when you're done, you export the edited video in one of a variety of formats. The program offers export templates, but you can export in any format that QuickTime supports, including H.264, MPEG-4, and Apple ProRes (if you have the ProRes plug-ins installed). Then, rather than having to import the results of your capture to a video-editing application, you can do much of your major editing directly within ScreenFlow. Audio, video, and screen-capture clips appear in a timeline at the bottom of the ScreenFlow window (if you record both audio and video from a camera, the two tracks will appear in a single clip, though you can extract the audio portion to a new track). Not only can you split and trim audio and video, but you can also scale portions of clips (for zooming in on important parts of the screen), add reflection, add transitions to the beginning of clips and between them, adjust a clip's speed, adjust color controls, add video filters, duck audio, add audio effects and filters, enlarge the cursor, show keystrokes, add callouts, annotate videos (with lines, arrows, and shapes), add titles and overlaid text, and record and import additional bits of audio and video. With version 4, Telestream moves beyond basic capture, edit, and annotation features to make multiclip projects easier to edit as well as to provide tools for enhancing (or, at least, altering) the look of your clips. In regard to making complex projects easier to edit, ScreenFlow 4 adds the ability to gang together multiple clips into a single nested clip. The nested clip appears on a separate timeline, where you can then edit those multiple clips as a single unit. For example, you can add a single video action where you zoom the nested clip to 200 percent. In past versions this kind of operation was more difficult--you either applied the action to each clip or, if they belonged to the same track, you could select all the clips that you wanted to apply the action to and then add the action to the first clip. This nesting is nondestructive. If you want to return to a clip within the nested clip to edit it, you can simply unnest the clips, make your adjustment, and, if you like, nest the clips again. The media files you bring into ScreenFlow from other applications can now update dynamically. For example, say you've imported a still image that you originally edited in Photoshop. You're not happy with the look of the image, so you return to Photoshop to tweak it and save it. Once it's saved, you can return to that image within ScreenFlow and choose to update it. ScreenFlow's media library is better organized than it once was. You can now search it, view assets in a list, and choose to arrange clips by name, date added, duration, or type. You can now add ADA-compliant (closed-caption) subtitles as caption tracks. The application now sports a chroma-key filter for green-screen effects. And ScreenFlow now supports OS X's Core Image video effects and audio filters. I've been using ScreenFlow for video projects for the better part of two years, as have many of my colleagues. And we'll all report that it offers a fast way to put together great-looking videos. After extolling its virtues, though, we'll also agree that it can be quirky. For example, when I've made cuts and moved clips around, the waveform preview in audio tracks can get confused--showing audio where there is none, or vice versa. I often use this preview for navigation, particularly when producing a screencast that has a long static image, which provides no clues about where I am in the project. The only way I've been able to correct the problem consistently is to save and close the project and then reopen it. Other times I'll hover my cursor over a video clip expecting to see the tools menu icon, where I can choose to add a transition, but it doesn't always appear. Then there are those operations that seem to take more steps than necessary. For instance, I might wish to add a bit of audio to my video after the fact. It seems logical that I'd place the playhead in the position where I want to record that bit and initiate the recording, and then the snippet would appear in the timeline, ready for me to edit. But no--instead I have to select the Media tab in the browser, click the Add Recording button, choose what I want to record (the screen, video, external audio, and/or computer audio), click Record, make my recording, locate the finished recording in the browser, drag it to the timeline, and then edit it. It's something you get used to, but it's a lot of steps for something that should be easier. Creating export presets can be tedious as well. You must choose the Export command, click the Manage button, copy an existing preset, and then edit and save that preset. Why not skip the copy step and simply allow me to create a preset from scratch? Then there occasions when you wish the program did just a bit more so that you didn't have to leave it. ScreenFlow's titling, for example, isn't as slick as iMovie's. You can certainly insert titles, but they're very basic. 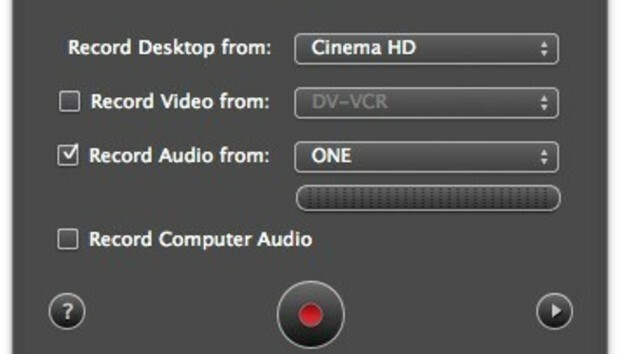 So when I need better-looking titles, I have to export ScreenFlow's work and import the resulting movie into iMovie. And while I understand that it's a higher-end feature, I'd dearly love for ScreenFlow to support keyframe animation--a feature for moving an element such as a title or image overlay across the screen. Given the number of words I've thrown at ScreenFlow's quirks, you might think I was lukewarm on the application. But that's not the case. True, I occasionally get frustrated with it, but overall it's a remarkable piece of work. When you become accustomed to its ways, you learn that you can create great-looking videos in very little time. If you're a screencaster producing videos on a Mac, and you want a capture/editing application that deals equally well with screen capture and live content, ScreenFlow is a must-have.